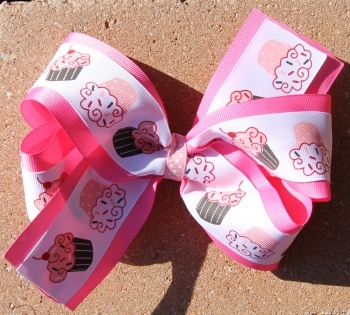 Yummy Cupcakes line this double delicious bow! There is hot pink, light pink, and chocolate brown cupcakes with candy swirls and polka dots all over this bow. There is a 2.25" hot pink grosgrain bow lined with a 1.5" white grosgrain bow. The 3/8" light pink with white polka dots wrap this center up for a sweet treat you will have to get for her Birthday Party. She will be as sweet as these cupcakes are for her next party event or for her Birthday Party!